We know that brain training pets can be hard. Taking the pooch to the park for a game of fetch for an hour of exercise is a lot of fun and tires them out. However, this alone doesn’t exercise your dogs brain. 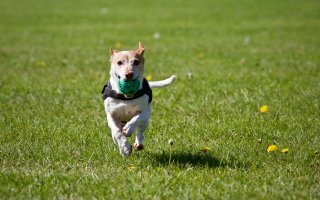 Every dog needs regular exercise – for both their body and brain. Here are just a few games you can play with your pet to keep them thinking. You might have seen this one done by a street-corner hustler in a film. However, it’s a great game that your pooch will love. All you need is three cups and an item your pet wants, such as a toy or great-smelling treat. Place the cups on the floor and mix them around in front of your pet. If they choose the right cup at the end, let them have their reward. If you choose to play this game with tasty treats, make sure you don’t go overboard with how often you play, or choose healthy snacks for your pooch. This is a great beginner game for brain training pets. Get an old muffin tin and some low-fat peanut butter or dog treats. Put the tasty treat in just a few of the holes then cover all of the holes with balls or some other kind of toy. Watch your pooch make their way to the treats as they figure out how to get the toy out of the way. It might be trickier than they think! If you don’t fancy making your own game, you can buy a ready-made one! Purchase a treat ball or puzzle and fill it with treats. Your pooch will need to figure out how to turn, roll and twist parts of the toy to get to their prize – working out their mental muscles in the process! You won’t get gold at the end, but you will get a mentally stimulated pooch! Get a super-smelly food or your pooch’s favourite toy. Show it to them and tell them to sit and stay while you hide it in your home or garden. Once it’s hidden, tell your pet to find it and watch them follow their nose and locate the treasure. If you want to know more about the benefits of keeping your pooch’s brain busy, click here to read our blog.